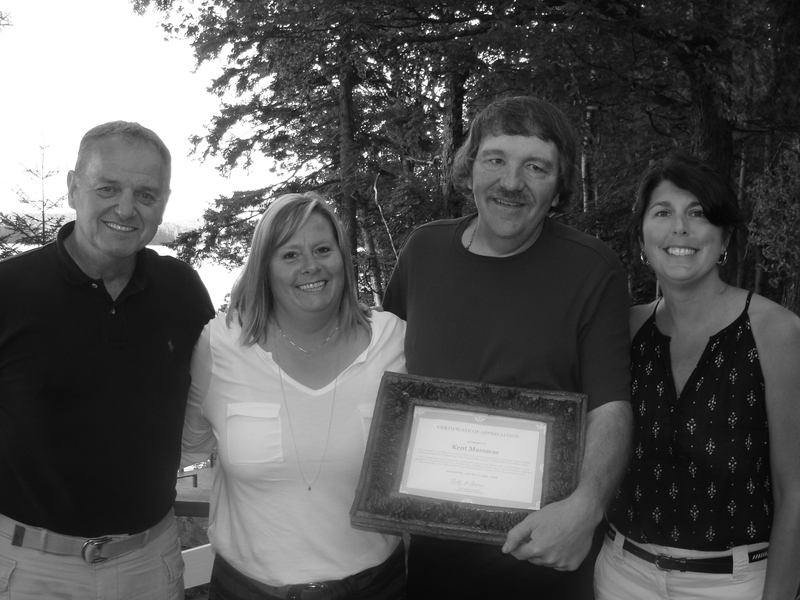 The Central Adirondack Association, at its Spring Fling held Thursday, July 19th at Northwoods Inn, honored Webb DPW employee Kent Massacar for his assistance with CAA events. Kent and his wife, Amy, were guests at the CAA Spring dinner meeting, where the award was presented by Kelly Greene, CAA president. Kent Massacar, Town of Webb DPW, holds his Certificate of Appreciation, flanked by CAA President Kelly Greene, CAA Event Coordinator Laurie Barkauskus, and Mike Farmer. The certificate reads as follows: “For extended and diligent service to The Central Adirondack Association far above regular responsibilities in conjunction with events at the George T. Hiltebrant Recreation Center. This entry was posted in admin and tagged appreciation award, CAA on June 26, 2014 by Mike Farmer.